Preparing for this year’s bluebirds, Troy shares how birds benefit him, and the diversity of his farm benefits those that, through loss of habitat, are in danger of becoming homeless. While many agriculturalists are getting inundated with countless bulletins, spreadsheets and meetings on what they should be doing to increase production and profits, I find myself simply trying to prosper by creating a diverse farm habitat where nature runs the operation. This idea cascades around the pasture and its fringes of hedgerows, woods, watercourses and wetlands. The mission statement of Habitat for Humanity is “Seeking to put God’s love into action”. Volunteers build houses that are simple, decent and affordable in which people can live and grow into all that God intended. This passion resonates well on the grasslands front too when building Bluebird houses that are also simple and decent in which our feathered friends can grow into all that God intended. Knowing there’s a bluebird of happiness. 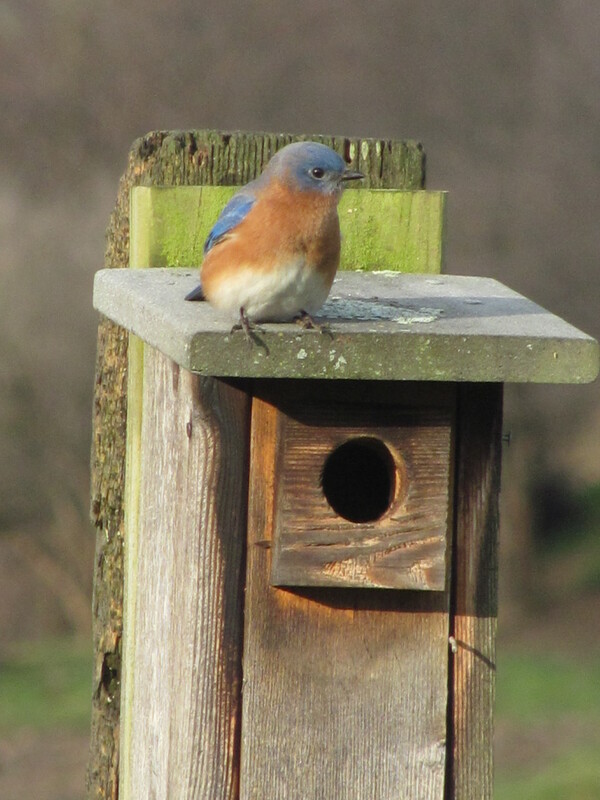 I rather enjoy the yearly bluebird box monitoring and cleanout since it signals the greening of my favorite crop. Armed with a cadre of screws, wood pieces (usually roofs and floors), essential hand tools, gloves and always a camera, I set out to make a house a better home. I must caution everyone to the fact that many critters like these tidy little houses. It’s not out of the question to reach up into the old nest and suddenly feel field mice using you as a ladder! 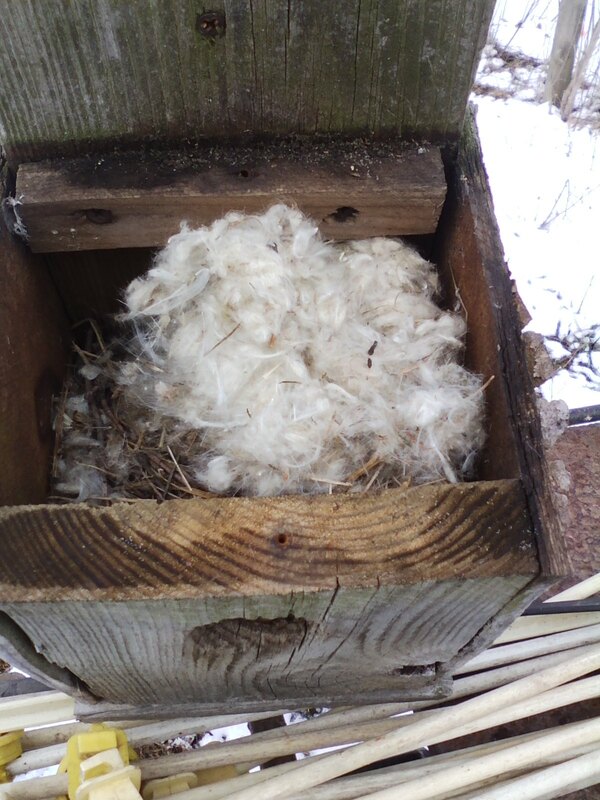 Every box seems to tell a different story after the bluebirds and swallows establish the base nest. Bees, wasps and spider nests are frequent inhabitants as well as the stubborn sparrows and wrens filling them full of twigs and old feathers. Cleaning these out and starting fresh equates to the satisfaction of a good barn white-washing. I am always intrigued how well the seasoned barnwood attracts the Bluebirds and swallows even though they may lack the box specifications by this rough carpenter. I believe it’s probably more about location then attractiveness which is a plus for my simple, decent and affordable structures. This fits me well as a 6 inch board scrapper. This year’s deluxe models have me reusing Trex, plastic wood, decking pieces into a virtually indestructible fortress against the elements. 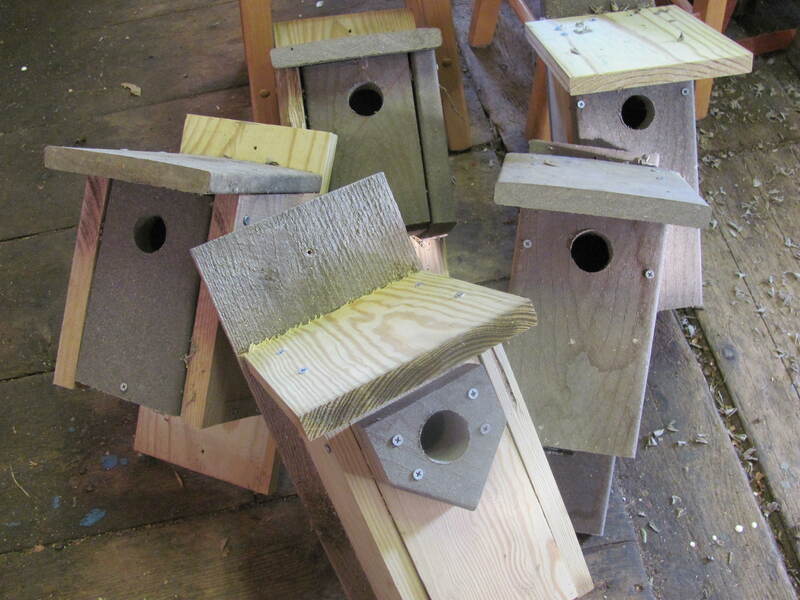 I was actually thinking of starting a campaign working with my local lumberyards to recycle these valuable scraps to make all kinds of nesting boxes, bat houses and pollinator villas. By the time I tidied up the insides and replaced any ailing roofs on my Bluebird trail, I bet it wasn’t 20 minutes when I saw the familiar flash of blue scoping out the renovated digs. How did they know? It’s certainly a pleasant mystery for an inspired grass farmer. They are also very photogenic; maybe as praise for giving them a sturdy home and a habitat where they can thrive. I feel it’s my duty to enhance our state bird against the constant barrage of habitat destruction. Now I learn that I’m in one of the 8 NYS DEC’s hot zones for building more grasslands suitable for endangered species. Although my beloved Bluebirds of happiness are important to my ecosystem, I’m also finding out that grassland bird species such as the Northern Harrier, Upland Sandpiper, Short-eared Owl, Horned Lark, Sedge Wren, Vesper Sparrow, Grasshopper Sparrow, Henslow’s Sparrow, Bobolink, Eastern Meadowlark, and Savannah Sparrows have seen an astounding 80-99% decline in abundance in just four decades. Working on these specific humanity homes is much more difficult as they have more sensitive nesting needs and conflict with grazing and haying practices. According to the “Department”, these birds are area-dependent species, meaning that they need large unbroken expanses of grasslands to thrive and reproduce which depend on several factors such as location, shape, surrounding habitats, and vegetative composition. 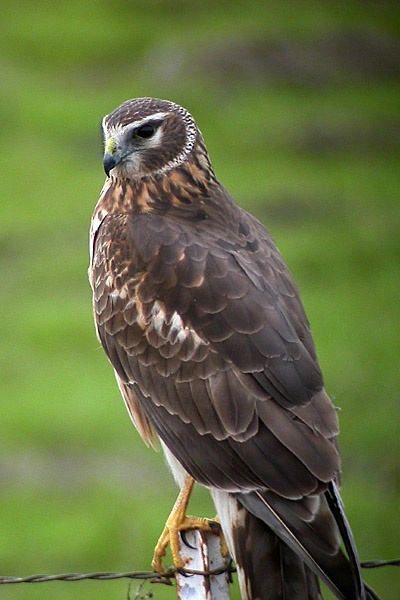 However, as a general rule, grasslands need to be at least twenty-five acres in size to offer appropriate habitat for these at-risk grassland birds in New York. My struggle has always been that of food producer for America and a respectful steward of my environment. Where is the balance? If I maximize production and profit, it seems my flora and fauna are negatively impacted. If I favor my habitat over profits, this can also impact my ability to thrive. I have thought about it deeply for a long time and it has come down to this. Folks have suggested I shoot all those pesky wrens so they won’t compete with the Bluebirds for nest boxes or that I should get rid of the cows so the sparrows can nest in a virgin sward. I find myself asking: What would God do? My interpretation continues to manifest in providing a diverse grassland ecosystem palate which yields to nature’s own sense of competition and fair play while I watch the game play out with limited interference. What I can do as a human is make management and production decisions that enhance the diversification of the landscape and keep it running on solar energy and sequestered carbon and water. Does it always work? No. But when it does it’s a beautiful thing indeed. The problem is we are dealing with so many environmental changes it’s hard to keep ahead of the thinking curve. For now I’m committed to working on self-improvement by studying and adapting to my local conditions with 7 generations in mind. I guess that’s what Habitat for Humanity (human or flying) really stands for; this idea of trying to always help others and give more than you receive in fulfilling God’s intentions. This article was previously published in Lancaster Farming. Troy’s thoughts inspired us to think more about habitat and other “ecosystem services” graziers provide. So look for future articles about the services you’re providing and how doing so might work to improve your bottom line. Troy- I get paid by NRCS to set aside 30A pasture from Apr thru July for ground nesting birds, which on my farm are mostly Bob-O–Links. I know where they like to go, but 2 yrs ago offered them my recently evacuated winter lot instead so that my cows could graze fresh grass in Bob-O-Link territory. Bad idea. No body came to the party., and me and cows reaped a bumper crop of flies later that summer. So I surrendered and the Bob-oLinks took over again last year. I also find that their nesting grounds provide perfectly fine fall stockpile and the trampled lignin would make you happy too. We’re glad you wrote. Thank you! We’re going to be talking about this NRCS program, and another option from private contributions, in the April 30 issue. It’s great to hear your experience.